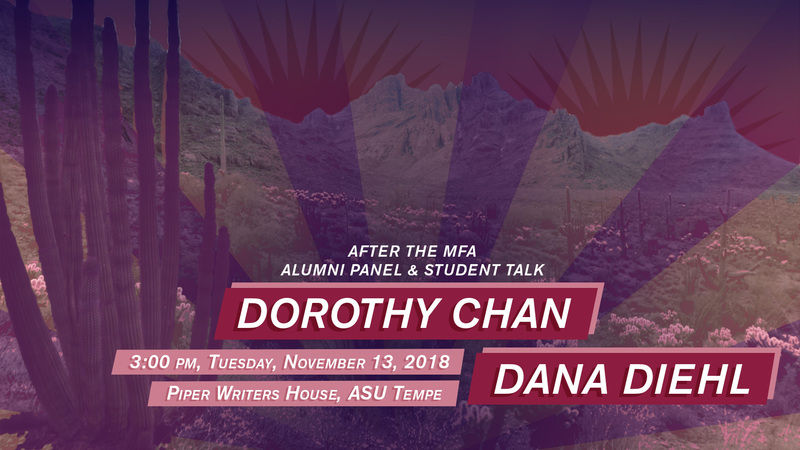 Join a special, intimate discussion with MFA alumnae Dorothy Chan (2015) and Dana Diehl (2015) as they discuss their careers post-ASU and offer strategies on being a writer in a professional landscape. While encouraged, RSVPs are purely for the purposes of monitoring attendance, gauging interest, and communicating information about parking, directions, and other aspects of the event. Dorothy and Dana will be reading at the ASU MFA Stellar Alumni Reading later the same day at 7:30 p.m. on Tuesday, November 13, 2018 in the Pima Auditorium in Memorial Union, ASU Tempe (301 E Orange Mall, Tempe, AZ 85281). For more information on the reading, visit the event page.